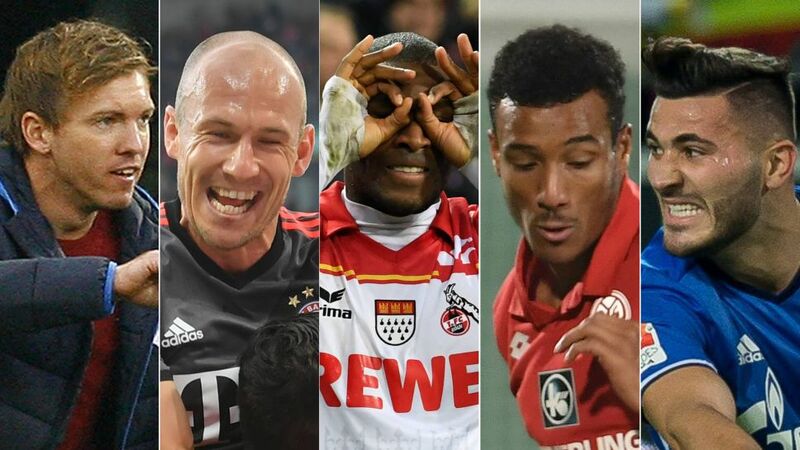 From goalscorers running rampage to last-minute line-up changes and a young coach cementing his top-flight credentials, there were talking points aplenty across the Bundesliga on Matchday 9. How did your Official Fantasy Bundesliga team do this week? Find out here! For the first half of 1. FC Köln's game at home to Hamburger SV on Sunday evening, it just did not appear to be Anthony Modeste's day. Booked for a handball and then having drilled a penalty against the post, the Frenchman cut a frustrated figure as he left the pitch at the break. Yet things were soon to improve for the 28-year-old, as he flicked in a Simon Zoller cross to break the deadlock, before scoring two more in the final ten minutes to seal a 3-0 victory for the Billy Goats. It was Modeste's first ever Bundesliga hat-trick and put him on 11 goals for the season so far, just four shy of his overall tally in 2015/16. There are 0-0 draws and there are 0-0 draws. The 89th Bundesliga Revierderby was of the goalless draw ilk that nevertheless entertains the fans, with some cut-throat football played at the SIGNAL IDUNA PARK. It had passion, pace and exuberance, but just no goal to show for it. Sead Kolasinac's match-saving tackle on Christian Pulisic summed things up from an FC Schalke 04 perspective, with his heart-on-sleeve lunge epitomising how desperate they were not to be beaten, and in the end even Dortmund were happy to accept a point in a contest which had fans on the edge of their seats from start to finish. A star was born in Augsburg's WWK Arena on Saturday – a star who goes by the name Robbendowski. No, FC Bayern München have not contravened any transfer regulations, they have just blended two of the Bundesliga's finest talents into one. Robert Lewandowski got back on the goalscoring trail in the Bundesliga after a 480-minute drought, and he had team-mate Arjen Robben to thank for setting up both his efforts. To show his gratitude, the Pole returned the favour to set up the Dutchman as Bayern put their Bavarian rivals to the sword in a sublime show of attacking strength, from Robbendowski. Draw up a league table from February 11, the day Julian Nagelsmann took charge of TSG 1899 Hoffenheim, and only Bayern and Dortmund have picked up more points than the Sinsheim-based club. It stands to reason, then, that their 1-0 win over Hertha Berlin on Matchday 9 – a fifth straight league win after four consecutive draws to start the season – lifted them into third place in the Bundesliga. With 19 points, they are already almost halfway to their stated target for the season of 40 points, yet only a quarter of the campaign is up. With their unbeaten record still intact, Nagelsmann takes his side to Munich on Matchday 10 with quite a swagger in their step. Recap all the Matchday 9 action with the round-up by clicking here!